Is GPU Encoding with 2nd GPU working correctly? I'm wondering if selecting a 2nd GPU in the GPU device section is working properly? I currently have a GTX Titan as my main card hooked up to my display and HTC Vive, and a 2nd GTX 980 Ti that is not attached to any device. I was hoping to run games on the VIVE through the Titan and use the 980Ti to capture/encode footage so I could get better recorded frame rates than using the same GPU to do both tasks (run the game at 90fps in the VIVE and encode the footage). Before I threw the 980Ti in this machine, I was using the Titan to do both (run the game and record) and when we're not recording footage, the frame rate hovers at 90fps like you'd expect. But when recording it drops to around 45fps or so depending on the game and scene. I was hoping that by installing the 980ti and using that as the recording GPU device in Bandicam that I could maintain 60fps while recording, but that doesn't seem to be happening. I've tried using the Nvidia NVENC H.264 settings (VBR) and selecting both the Titan and 980Ti give me roughly the same frame rate when recording (45fps) but the game is running at 90 when we're not recording. This seems like it isn't working correctly to me, but maybe my expectations are a little off? I was expecting to see a more drastic improvement by offloading the encoding, but it barely seems to be making a difference if at all. Is there any way to double check to make sure that this feature is working properly? I'm sure there isn't that many people using it, so maybe something's been overlooked? Any info or things to try would be most appreciated. Thanks! Re: Is GPU Encoding with 2nd GPU working correctly? To clarify your issue, please let us know which GPU is plugged into the primary and the secondary PCIe slot. Hi there! The Titan is in the Primary slot (PCIEX16) and the 980ti is in the (PCIEX8) secondary slot. I'm on a GA-Z77X-UP5 TH motherboard if that helps any! 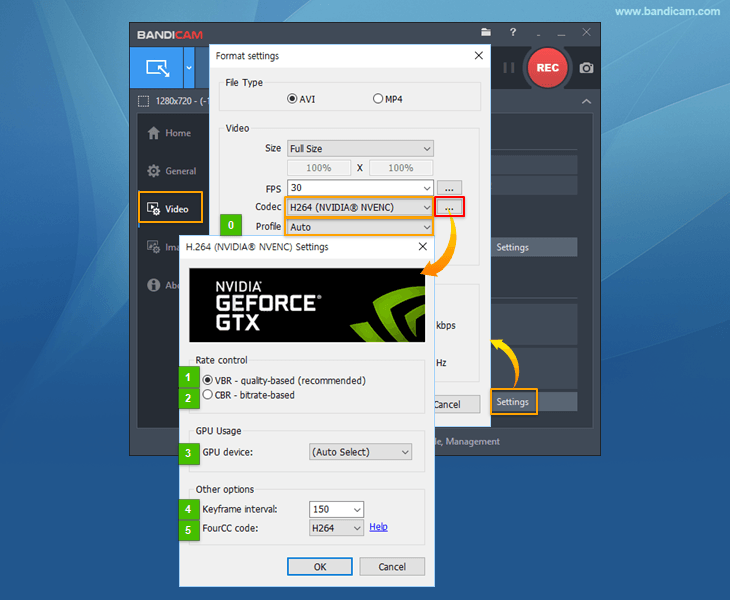 There is a possibility that the power management options of your PC affect Bandicam's performance. Please check the 4th solution on the linked page. 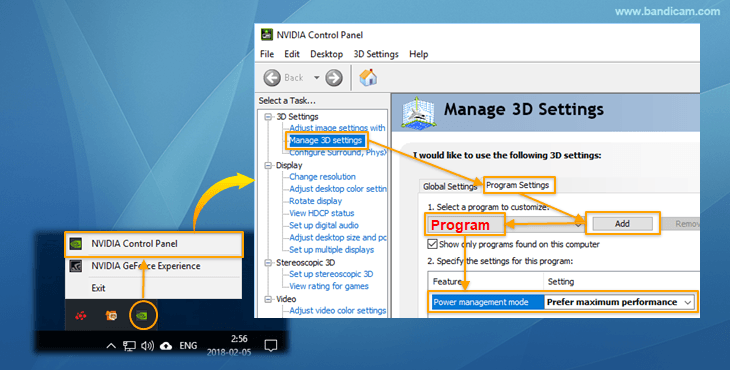 Please, go to "NVIDIA Control Panel -> Manage 3D settings -> Add 'Bandicam' -> and select "Prefer maximum performance" for Power management mode. Hey guys! I gave this a shot, but unfortunately it doesn't seem to be making any difference. I did do a bunch of different tests with a bunch of different codecs/configurations - And one area where using the 2nd GPU does seem to make a difference is when using the CUDA encoder, rather than the NVENC encoder. When using the CUDA encoder, and I set Bandicam to use the TITAN (the same card running the VIVE) and record, the frame rate drops to about 20fps. When using the 980Ti as the 2nd GPU, it drops to around 45fps again, so there is an improvement there. However when doing the same experiment with the NVENC encoder, using the Titan or 980ti as the encoding GPU produces the same 45fps frame rate when capturing. If there's anything else I can do to help track down what might be occurring here, that would be most appreciated. Thanks! Hi guys, yes of course, that's how i'm trying to get this to work. Here's a screenshot with the two GPU's listed in that popup menu. I honestly think there may be a bug here with NVENC encoding since there's zero performance gain when selecting the 980Ti over the Titan. I would love to be proven wrong, so let me know if there's anything else I can try! Thank you for sending the file.